Video footage from the scene of the blast recorded by VOA Bangkok bureau chief Barry Newhouse. 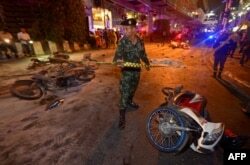 At least 12 people were killed and 87 were wounded in an explosion Monday near a Hindu shrine in central Bangkok, marking the worst bombing in the Thai capital in more than a decade. 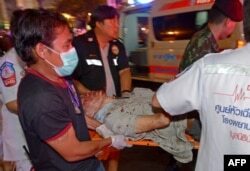 Thai rescue workers transport an injured person after a bomb exploded outside a religious shrine in central Bangkok late on Aug. 17, 2015 killing at least 10 people and wounding scores more. A Thai soldier ropes off the scene after a bomb exploded outside a religious shrine in central Bangkok late on Aug. 17, 2015 killing at least 10 people and wounding scores more. 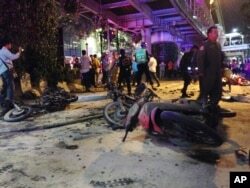 Motorcycles are strewn about after an explosion in Bangkok, Aug. 17, 2015.